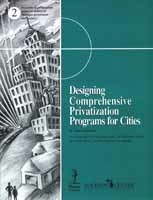 Reason Foundation/Mackinac Center for Public Policy "how-to" manual, Designing Comprehensive Privatization Programs for Cities, is available from the Mackinac Center for $10.00 postpaid. Call (989) 631-0900. If something is worth doing, its worth doing right. 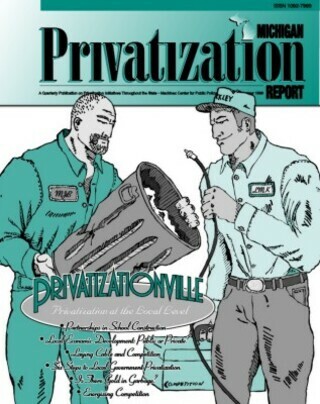 In the case of privatization, not doing it right could be worse than not doing it at all. Poorly privatized municipal services not only give privatization a bad name, they can cost more than leaving inefficient government services in place. Local officials considering privatization should keep their eyes on the goal: to reinforce and enhance their ability to govern and increase the level and quality of services for their constituents. Choosing the Privatization Team. Local officials should choose carefully a highly qualified team to design and implement the privatization program. Team members should understand that for privatization to be successful, vendors and investors must realize a certain level of economic return. They must be able to develop alternative plans that balance a governments constraints and opportunities with the often rigorous requirements of private investors and the capital market. They should know and have access to vendors for contracting. They should be able to conduct exhaustive financial analyses and develop alternative deal structures from the perspectives of both the government and the private sector. Finally, they should be particularly sensitive and responsive to the participating public, special interests, media, and voters. Privatization Techniques. Most governments using privatization to generate new revenue or reduce costs typically use only one or two types of privatization. The most common types of privatization are contracting out public services to the private sector and selling off government-owned enterprises in their entirety. Identifying Privatization Opportunities. There are typically many more opportunities for privatization than local officials realize for solving problems involving government-owned assets, facility operations, services, debt structure, and other facilities and infrastructure. Identifying these involves assembling and organizing data, establishing criteria to qualify each privatization opportunity for implementation, and applying privatization techniques to the fullest possible range of government services and facilities. Another technique, made famous by Indianapolis, Indiana, Mayor Stephen Goldsmith, is called "competing-out" contracts. Goldsmith allows his public-sector employees to bid on contracts in competition with private vendors. One Indianapolis union local has actually been able to increase its membership by winning the lions share of contracts on which it bids. By applying one or more privatization techniques to the wide range of government assets, facilities, infrastructure, subsidized agencies, and other government activities, a city-wide privatization program could yield 100-200 opportunities. Evaluating Privatization Opportunities. Once privatization opportunities are identified, they must be evaluated in detail to determine whether they should proceed to implementation. Each privatization opportunity is put through exhaustive financial feasibility, legal review and cost/benefit analyses. These analyses will require additional data. Moreover, each privatization opportunity should be tested against the evaluation criteria established earlier. Developing Implementation Plans. Plans should be drawn for the privatization opportunities that receive a high ranking. These plans should outline the specific steps required to complete the transaction. They typically include detailed financial analyses and implementation schedules; clearly assign the responsibilities of each party; outline the bid solicitation process; evaluate the bids; specify how negotiation with winning bidder should be conducted; and explain how the required contractual arrangement should be prepared. Overcoming Obstacles to Privatization. Privatization efforts face many obstacles, including existing legislation and regulations, public employee resistance, misperceptions about privatization, and a general resistance by governments to change. Privatization programs, if they are to be successful, must incorporate innovative strategies to overcome obstacles to privatization early in the program. You can improve your chances of a successful privatization effort by a) doing your homework; b) ensuring that you maintain the desired level of control over the service being bid; c) clearly explaining the performance standards you expect; d) keeping all parties to the transaction informed during the process; and e) establishing and adhering to a strict monitoring process. Conclusion. Traditional methods of solving budget crises such as tax increases, deep service cuts, or issuing short-term debt have significant economic or political pitfalls. Comprehensive privatization programs offer city governments a way to maximize revenue, cut costs and make greater use of private capital for public services and facilities. Comprehensive programs offer three main advantages over traditional governing strategies. First, they afford governments greater flexibility by allowing officials to choose between a variety of privatization techniques for solving each problem. Second, the cumulative economic impact of implementing all, or some portion of, the menu of privatization opportunities is potentially much greater and longer lasting than short-term fixes such as tax increases or bond offerings. Lastly, if governments properly manage the privatization process and carefully monitor the implemented privatization projects, government spending can be held in check and high quality can be achieved.